Additional health care options. Better access to care. Clinical studies offer benefits to eligible participants that may not be otherwise available, and can be a good way to access expert health care at no cost to you. In addition to care you receive during the study, you will be able to continue your care with your regular GP. In some cases, the study treatments will be complementary to your current treatment. AusTrials conducts clinical studies in a variety of therapeutic areas including diabetes, heart disease, stroke and joint disease. AusTrials study coordinators carefully screen all potential volunteers for each study. They will be able to explain the study to you in depth, make sure the study will be a good fit for your care needs, and answer any questions you might have about the study. Volunteers play an important role in making clinical research and the development of new treatments possible. By participating in an ethically approved clinical study you play an active role in your health care, and assist with the development of new treatment options for all patients. To find out if there is a study that could benefit you, visit our Current Studies page. 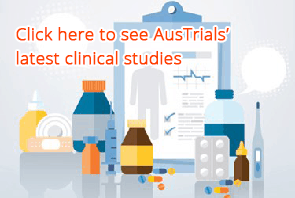 If you have questions or concerns about participating in a clinical study, contact an AusTrials representative, or see the Links below for additional resources.